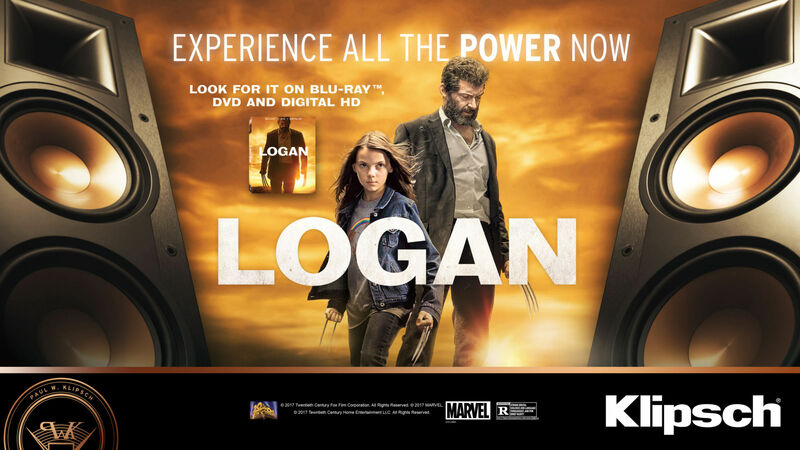 INDIANAPOLIS (May 16, 2017) — Klipsch®, a tech-driven audio company, today announced its exclusive home theater speaker, sound bar, and headphone partnership for the home entertainment release of the movie Logan on Digital HD (May 16), and DVD, Blu-ray™, and 4K Ultra HD™ with Dolby Atmos® (May 23). The partnership includes a “Logan x Klipsch Sweepstakes” promotion. Directed by James Mangold, Logan is a 2017 American action hero film featuring the Marvel Comics character Wolverine. It is the tenth installment in the X-Men film series, as well as Hugh Jackman’s third and final Wolverine solo film. Logan debuted in February 2017 and grossed more than $603 million worldwide, garnering praise from critics and audiences as one of the best action hero movies of all time. Logan’s seismic power and heroic performance are an ideal fit for the Klipsch brand, which is known for accurately reproducing the power, detail and emotion of the cinema-quality sound experience for more than 70 years. Klipsch audio/video retail and online partners around the world benefit from this partnership by using Klipsch and Logan branded in-store point of purchase materials, the movie trailer, as well as digital and social media assets. Additionally, Klipsch is running the “Logan x Klipsch Sweepstakes” in the United States May 16 through July 31, 2017 on Klipsch.com and its social media channels. Entrants are encouraged to sign up at Klipsch.com/Logan for the chance to win a grand prize package consisting of a Klipsch HD Wireless 5.1 system – the first ever future-proof wireless home theater system delivering unparalleled cinema-quality sound – plus the Logan Blu-ray combo pack and Logan prize pack featuring a metal notebook, limited edition metal poster, T-shirt, messenger bag, and hoodie (MSRP $3,190.50). The partnership between Klipsch and Logan follows in the footsteps to Klipsch’s successful promotions with two Twentieth Century Fox Home Entertainment properties: X-Men: Apocalypse and Deadpool, the latter being the highest-grossing R-rated movie of all time.